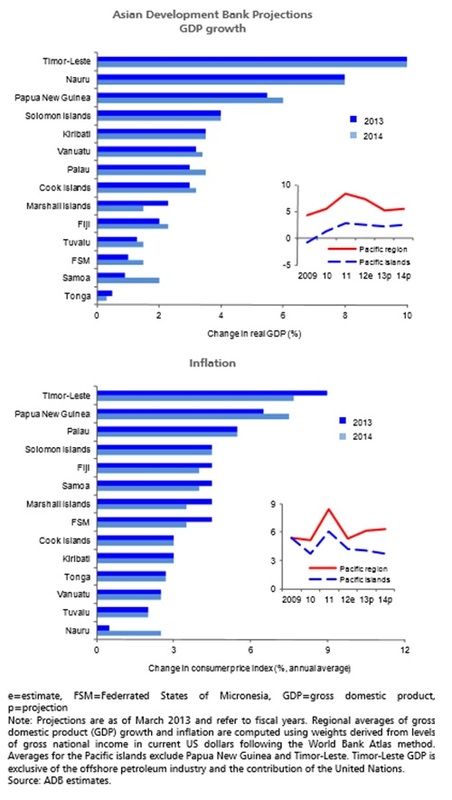 The Asian Development Bank’s March 2013 edition of the Pacific Economic Monitor covers the growth outlook for Pacific island economies as well as topical policy issues. Here are the agricultural parts and other interesting information presented for context. “The value of Pacific exports to New Zealand increased by 2.5% in 2012 compared with 2011, supported by greater exports from Nauru (phosphate) and PNG (coffee and food products). Fiji’s exports of agricultural products to New Zealand fell by 11% during the same period, partly reflecting lower sugar production”. “Performance of some sectors of the economy worsened relative to 2011. Sugar production fell 7.1%, reflecting weak global demand and the impact of floods early in the year. Gold production also fell by 8%, but bauxite production remained buoyant. Tourist arrivals declined by 2.1% in 2012. December arrivals were driven down due to flight cancellations caused by Cyclone Evan. The cyclone caused an estimated $42 million (about 1% of GDP) in damage, just under half of which was to the non-sugar agriculture sector. Given these developments in key sectors, 2012 growth estimates are likely to be adjusted downward. “Growth is expected to pick up to 3.2% in 2013 and 3.4% in 2014, as delayed construction projects begin to be implemented and agricultural production recovers. Tourist arrivals are also expected to grow in 2013, partly due to diversion of visitors from Fiji due to Cyclone Evan.